Scavengers are functionalized silica gels designed to react and bind excess reagents, metal complexes and/or by-products. Our SiliaMetS® Metal Scavengers and SiliaBond® Organic Scavengers allow efficient purification at any scale. 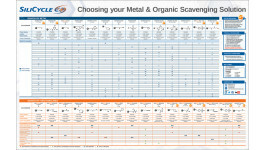 This poster helps you choose among SiliCycle's wide range of scavengers.